The mission of the Faculty of Allied Health Sciences is to educate and train knowledgeable, skillful and committed allied health professionals who shall assume responsibilities as members of the health care team in the Kuwaiti health care delivery system. In particular, the Faculty aims to graduate allied health professionals who have the requisite entry level competencies, meet the professional standards and who shall adhere to professional ethics in their professions. The Faculty also aims to contribute to the development of the profession and allied health services in Kuwait, both in the Kuwait health care delivery system and in private hospitals, by providing consultancy and other services. To develop, monitor, evaluate, review and maintain a curriculum for the Bachelor's degree programmes that reflects the state-of-the-art in the professions and prepares students for work as a member of the health care delivery team. To liaise with staff in the Ministry of Health in order to provide the optimal environment in the Ministry hospitals and clinics for baccalaureate students to achieve the entry level competencies, through hospital rotations, in their respective profession. To develop, monitor, evaluate, review and maintain postgraduate programmes (Diploma and Masters) that impart and enhance allied health professionals' knowledge and capabilities in their professional area. 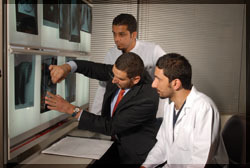 To develop and provide continuing education/ continuing professional development (postgraduate programmes, short courses, lectures, workshops and seminars) for Ministry of Health staff that meet the changing health care needs of Kuwait, and that keep them abreast of the state-of-the-art in their professions. To recruit well qualified and experienced teaching and support staff who will act as role models for students and who keep themselves abreast with scientific advances in the field and apply the state-of-the-art in all endeavours: teaching, curriculum development and assessment, research, clinical supervision and community service. To provide baccalaureate students with the necessary support and guidance in terms of counselling, and feedback on academic and clinical performance. To provide an optimal learning environment in terms of classrooms, laboratories, learning resources and modalities of teaching and learning. To provide consultancy services to hospitals and clinics in the public sector health care delivery system and in the private sector.